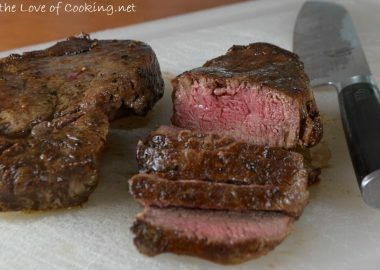 I wanted something quick and easy to serve for dinner. I found some frozen shrimp and decided to finally try Ina Garten’s roasted shrimp cocktail. I simply seasoned the shrimp with a drizzle of olive oil then some sea salt, freshly cracked pepper, and garlic powder, to taste. I roasted them for less than 10 minutes and served them with a sauce made from a combination of ketchup and wasabi horseradish that my sister Dana got me hooked on a few years ago. 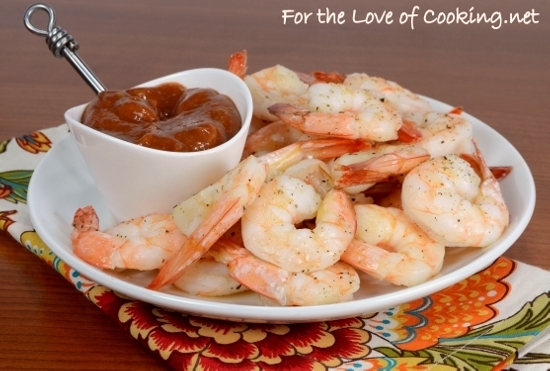 The shrimp were tender, delicious, and so tasty dipped in the sauce! 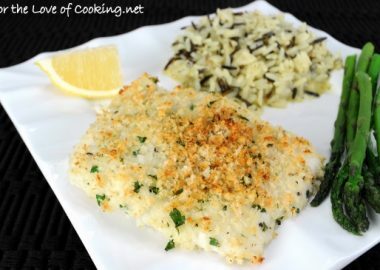 This dish was a HUGE hit with the whole family and I will be making it again soon. Preheat the oven to 400 degrees. Line a baking sheet with tin foil then coat with cooking spray. Combine the ketchup and wasabi horseradish in a small dish then stir until well combined. Set aside. Peel and devein shrimp making sure to leave the tails on. 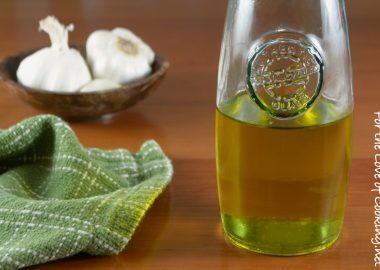 Drizzle the shrimp with the olive oil then season both sides with sea salt, freshly cracked pepper, and garlic powder, to taste. 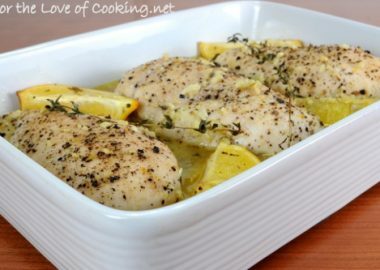 Place into the oven and roast for 8-10 minutes or until cooked through. 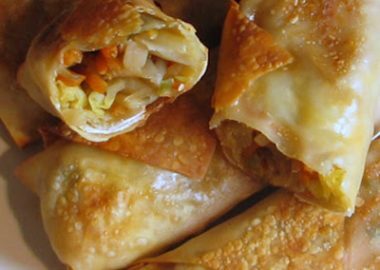 Place onto a serving tray and serve with the prepared sauce. Enjoy. There is a recipe from Ina Garten that has bern on my radar for some time. Thanks for the timely reminder.It just sounds so delicious roasting the shrimp. This is pretty much my dream dinner! Super delicious! Oh yum! 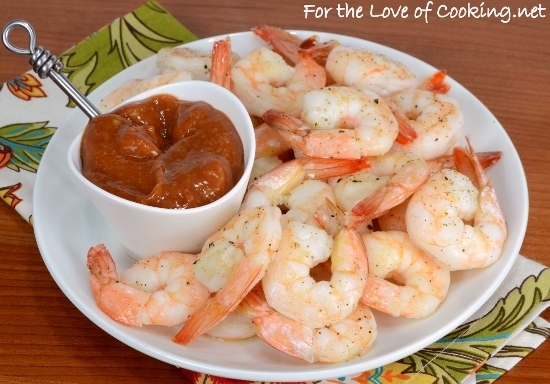 Roasted shrimp with cocktail sauce? Delish! I’ll gladly eat this for dinner anytime! Simple and perfect… can’t beat that 🙂 P.s… I love the wasabi horseradish too!!! I have made Ina’s recipe many times. 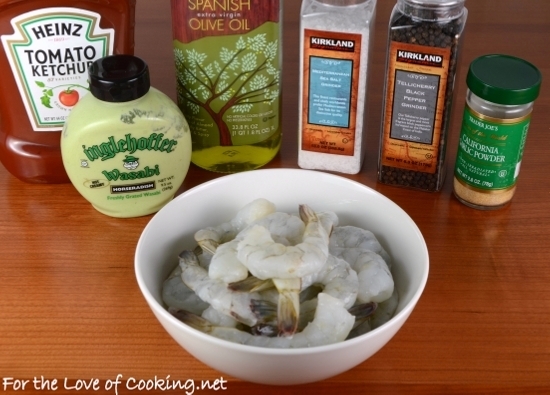 It is the best way to make shrimp cocktail. I’ve never had roasted shrimp before but I think I would like it a lot more than boiled or steamed shrimp. I just made this last weekend. It was a hit at our house too!! Sounds like a great way to cook the shrimp but boy talk about having blinders on – I would have never considered anything but chilled shrimp for shrimp cocktail – duh. 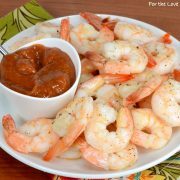 Our friend Greg always brings shrimp cocktail to Thanksgiving dinner, but your cocktail sauce looks like something I might have to offer today! I actually don’t think I’ve ever seen shrimp ROASTED before! How is that even possible?! I love roasted shrimp. I learned it from Ina too! 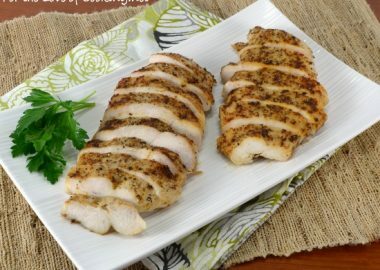 Yours look wonderful Pam, such an easy, delicious meal! This looks so simple, but so delicious. I would love this. A simply and delicious appetizer! How funny, I just made these for the first time tonight too. Only about half made it to shrimp cocktail. They’re delicious right out of the oven too! I’ll never boil shrimp again. 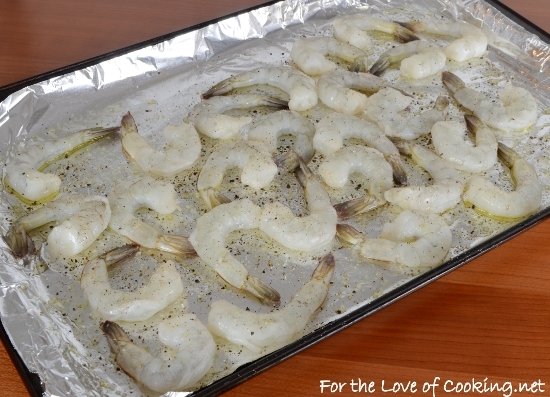 This roasting method made the shrimp taste so much better! This recipe is really pretty !! 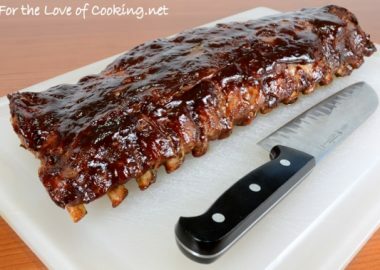 Superb & delicious recipe!